There are few foods in life I like more than watermelon. It’s a summer staple at our house as I’ve converted nearly every single child into a watermelon eating machine. But what is loved even more than watermelon is frosted watermelon. Yep, frosted watermelon making up the base of this healthy fruit pizza. I said it, I did it and we loved every bite of it. You don’t even need cake, for real though, when you use watermelon as the base and top it with all of the goodness. And we’re talking goodies like, ripe peaches, sweet cherries, strawberries, blueberries, homemade soft granola streusel and butterscotch sauce. That is all packed on top of the fluffy, cool frosting and crisp and juicy watermelon. The only problem I foresee is one base is not enough. 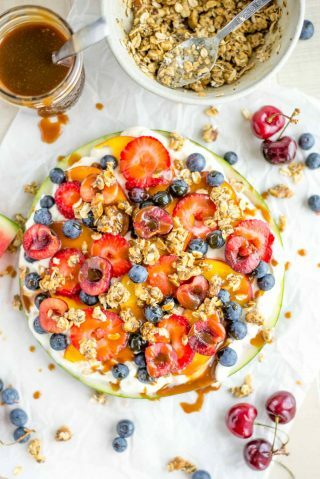 You must double it because there is no shame in eating more than one piece, I mean how much healthier can fruit pizza get? So I can assure you that two slices is the average serving. The good news is you can whip this up in under 20 minutes. Yep, pretty much every reason to love it is spelled out above. It’s unique, exciting, kid-friendly, adult-loving, mostly healthy and deeeeelicious! 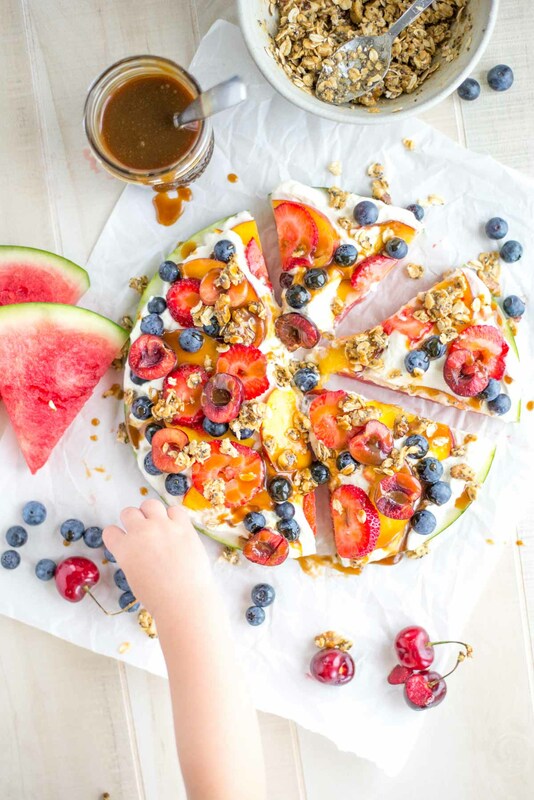 I’d say you’d better add this healthy fruit pizza to your weekend plans and then next weekends and the next and maybe, just maybe have one slice for breakfast. Because it’s summer and it’s watermelon and heck, why not live a little? Cut watermelon slice and set aside. In a medium bowl, whip cream, cream cheese, powdered sugar, and vanilla until stiff peaks form and set aside. In a small saucepan make butterscotch sauce (you will have extra left over). 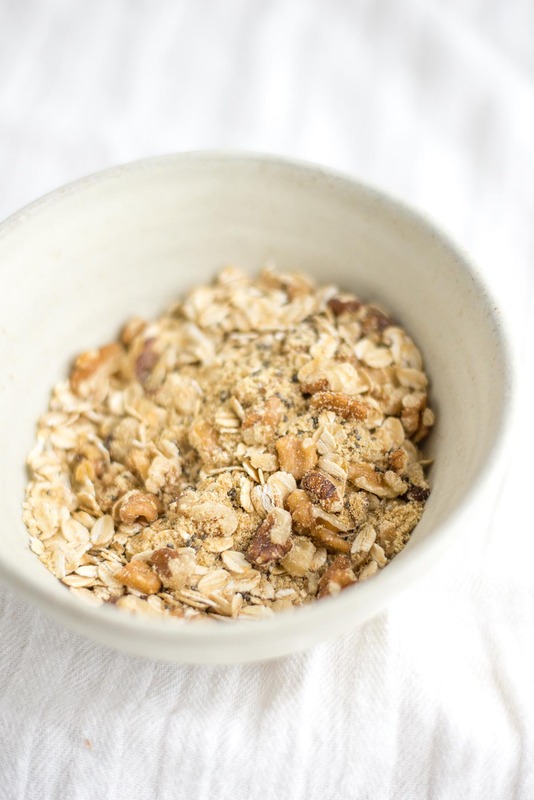 Meanwhile in a small bowl mix oats, chia seeds, flaxmeal and chopped walnuts. 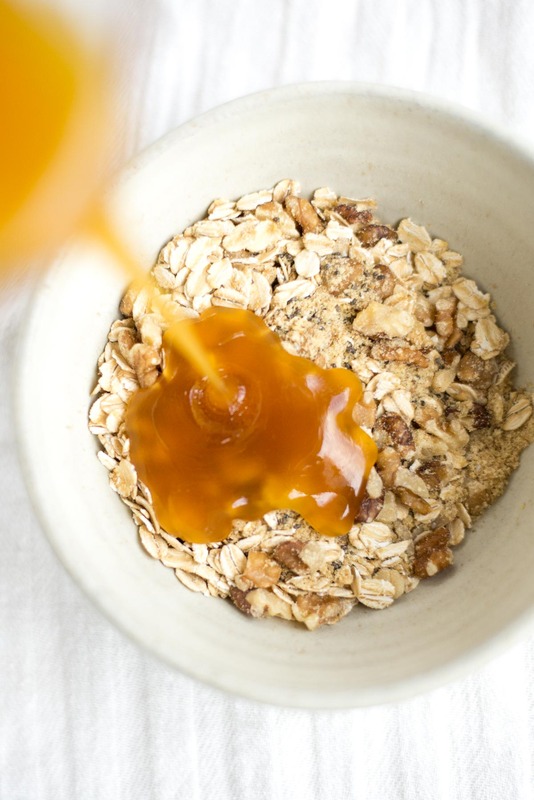 Stir in melted butter and honey until a moist crumble forms. 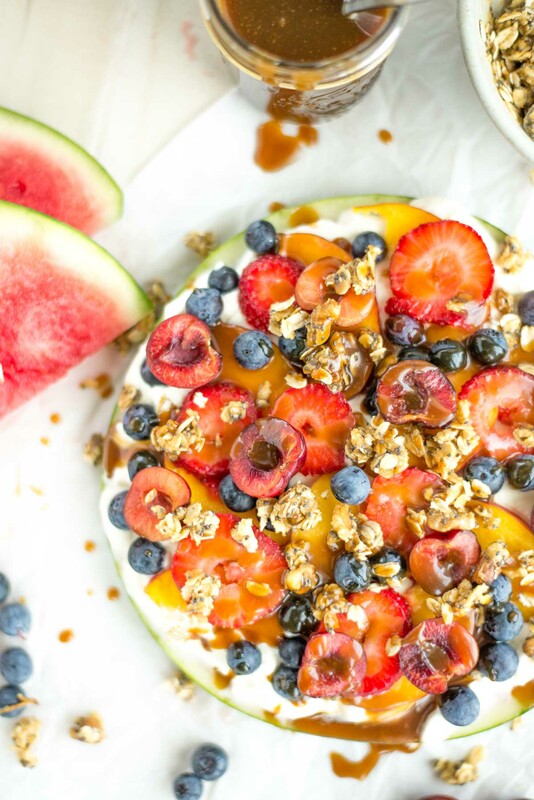 To assemble, spread frosting gently over watermelon, top with sliced fruit, sprinkle with granola and drizzle with butterscotch sauce.